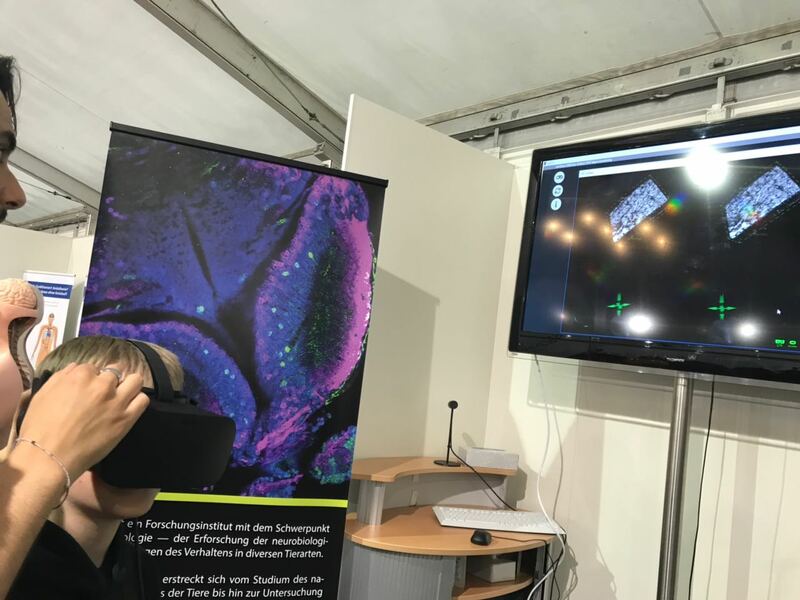 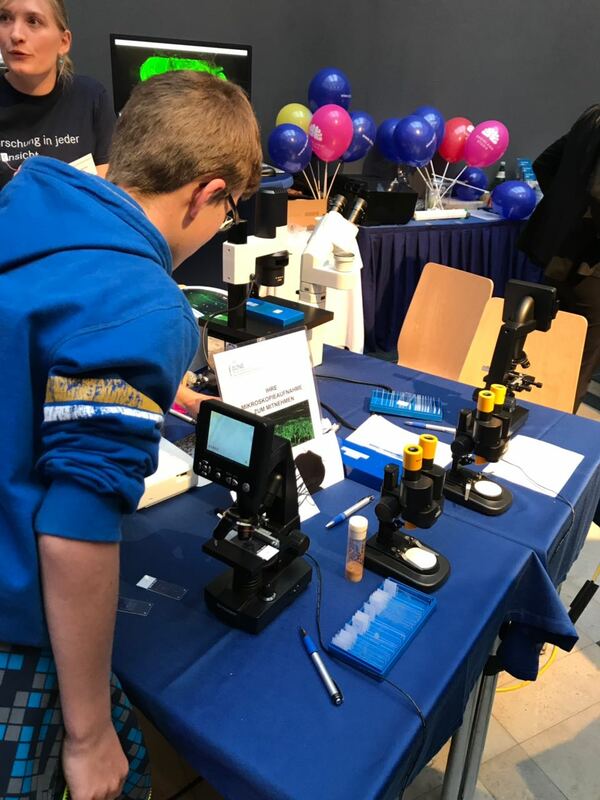 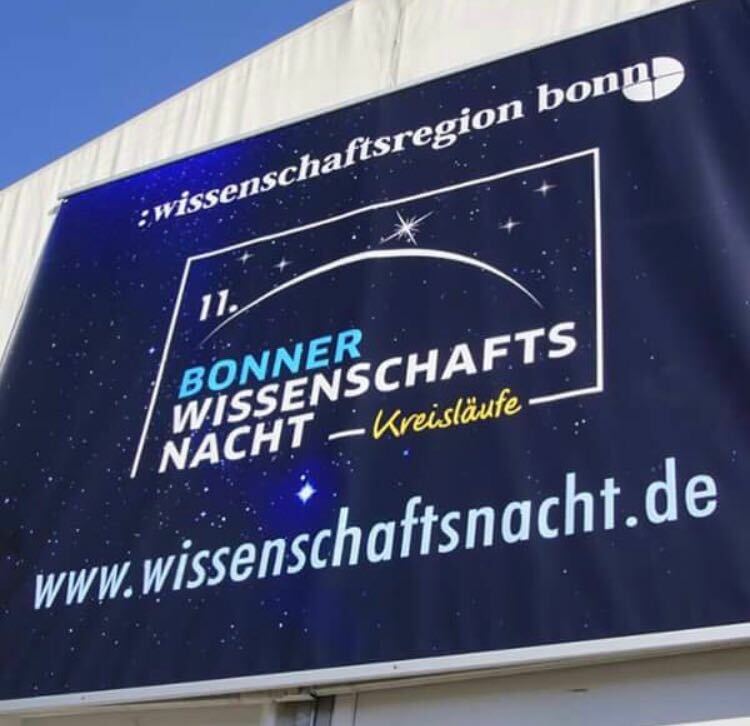 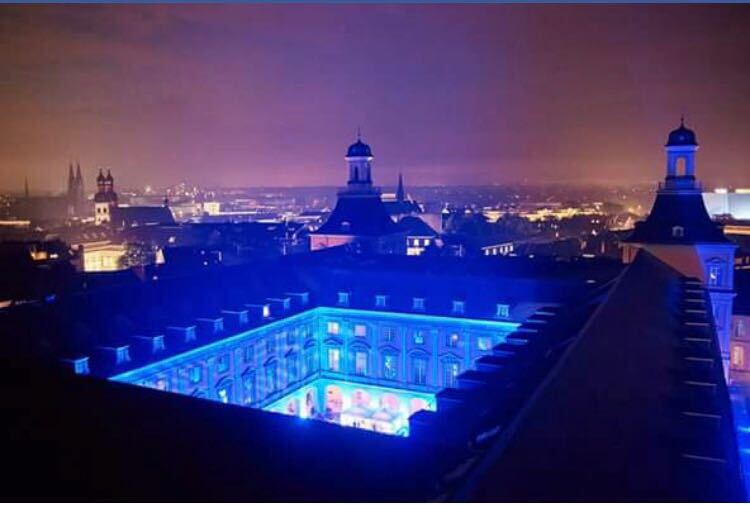 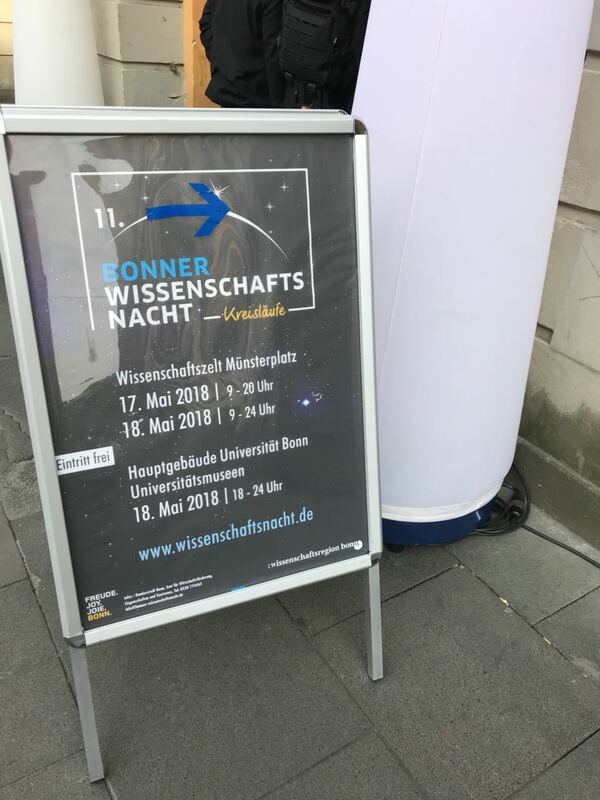 The 11th „Science Night“ of the University of Bonn took place at the Münsterplatz and the Central Building of the University of Bonn. 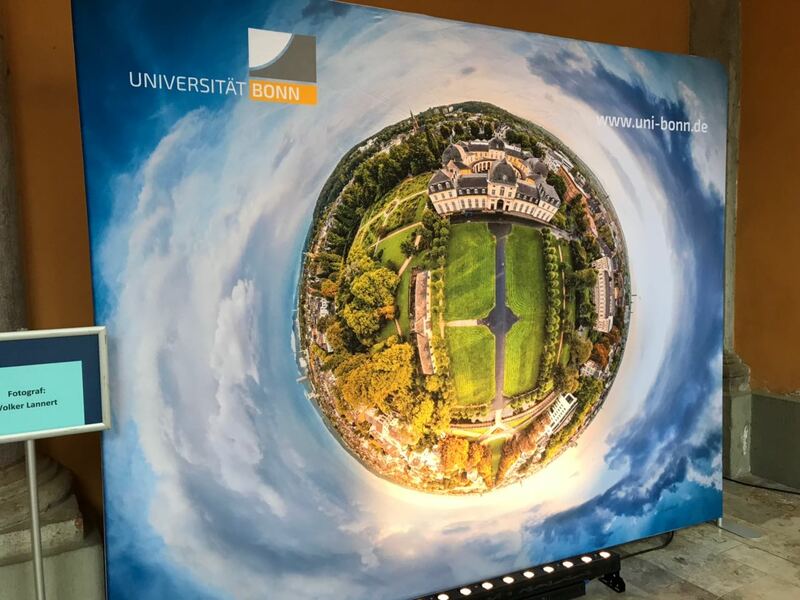 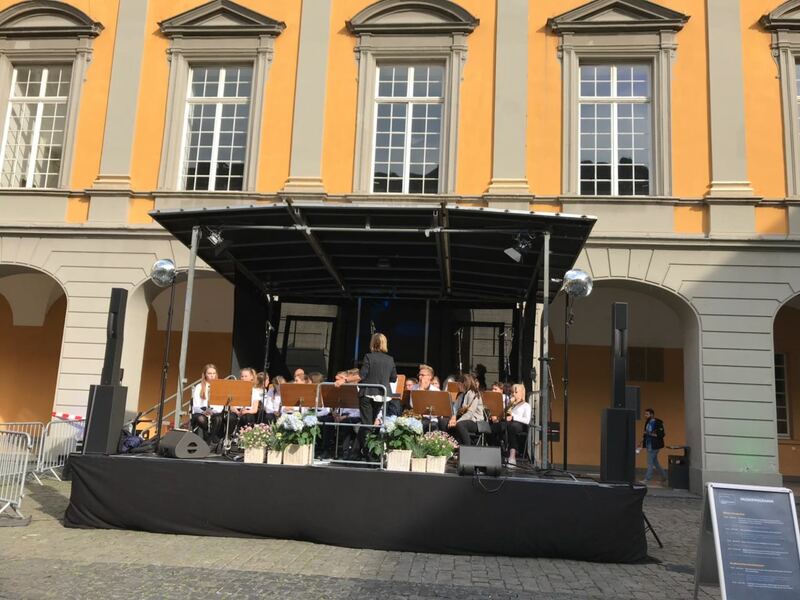 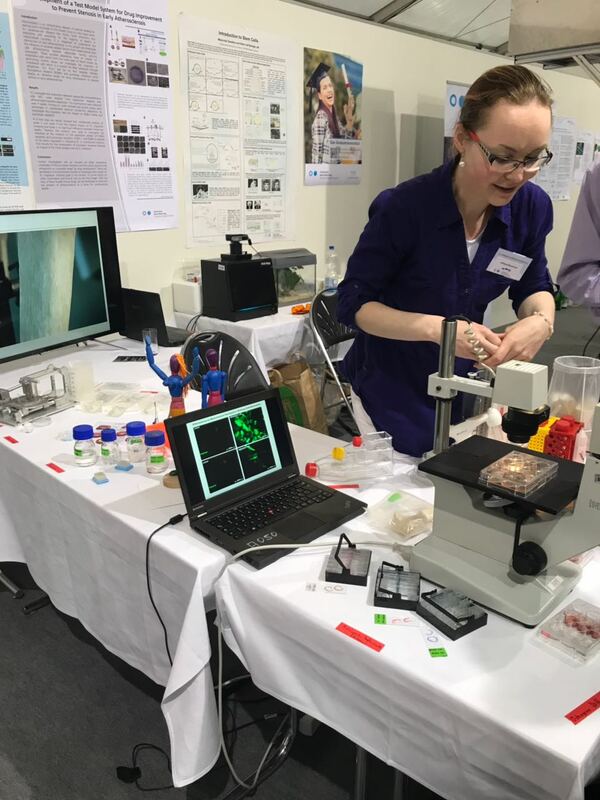 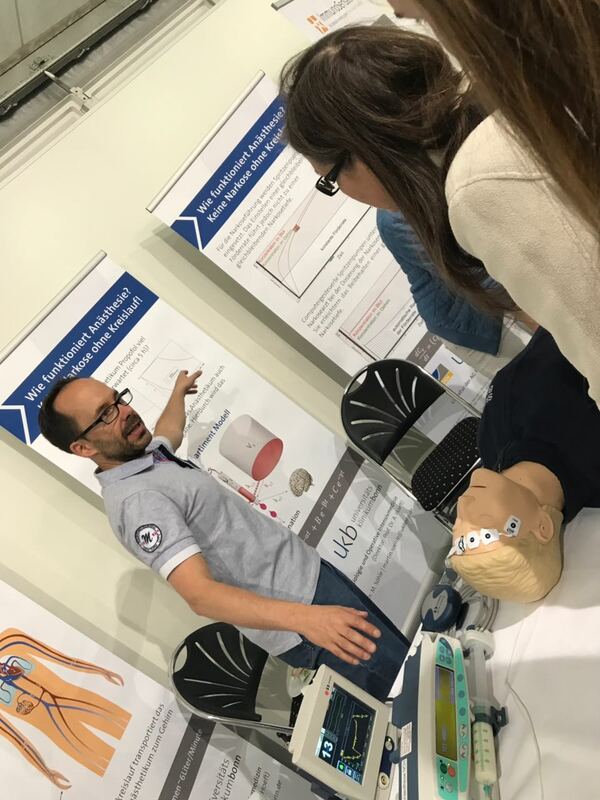 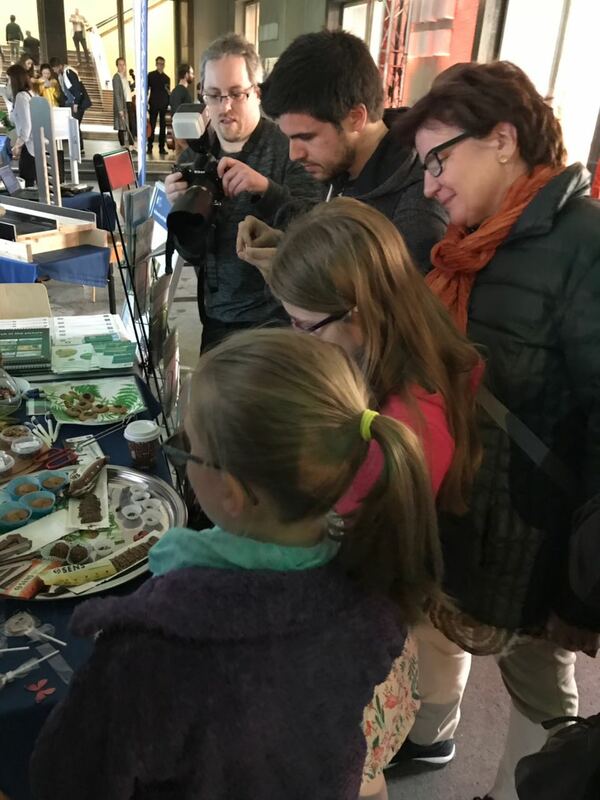 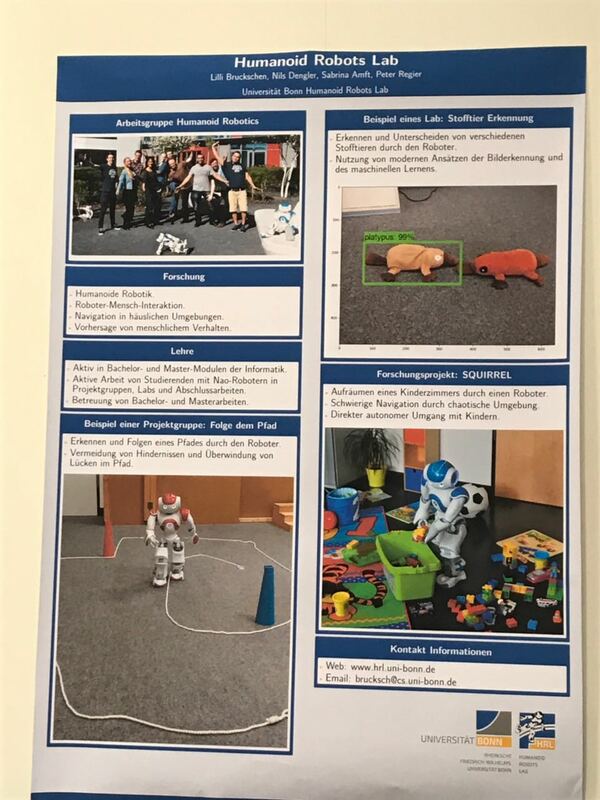 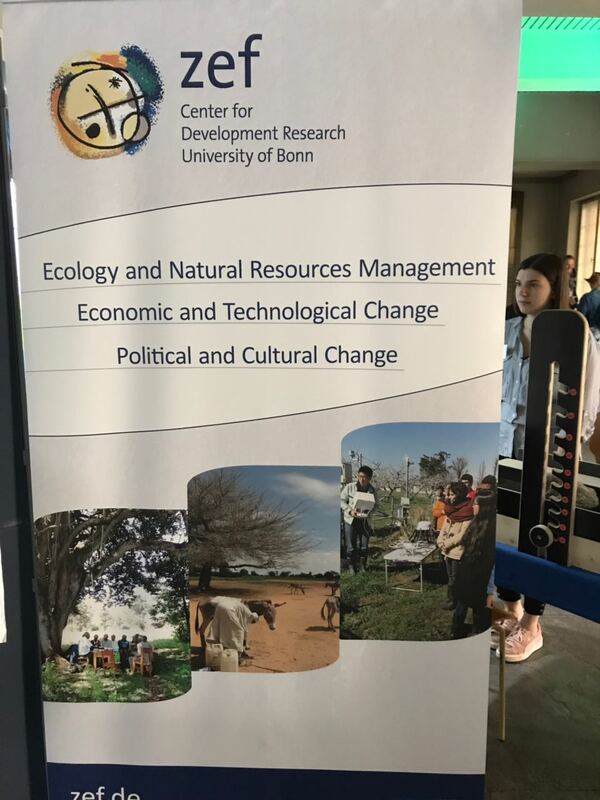 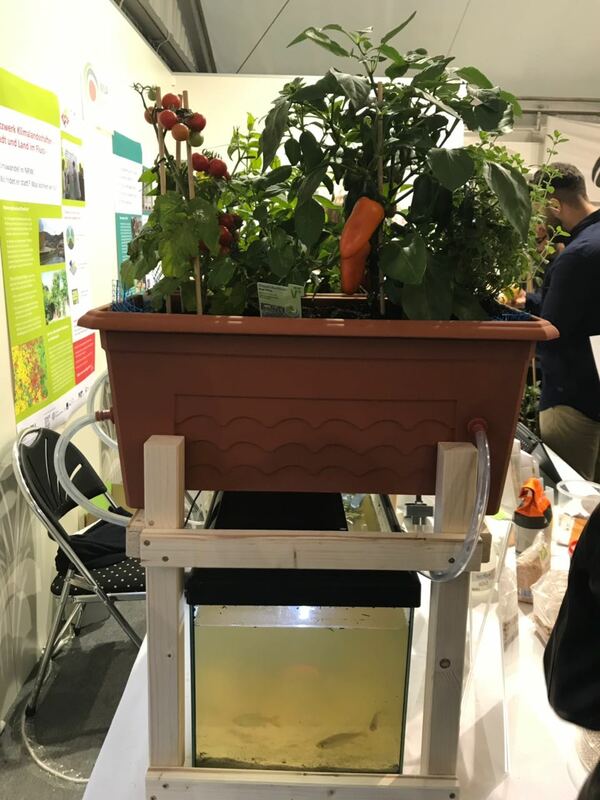 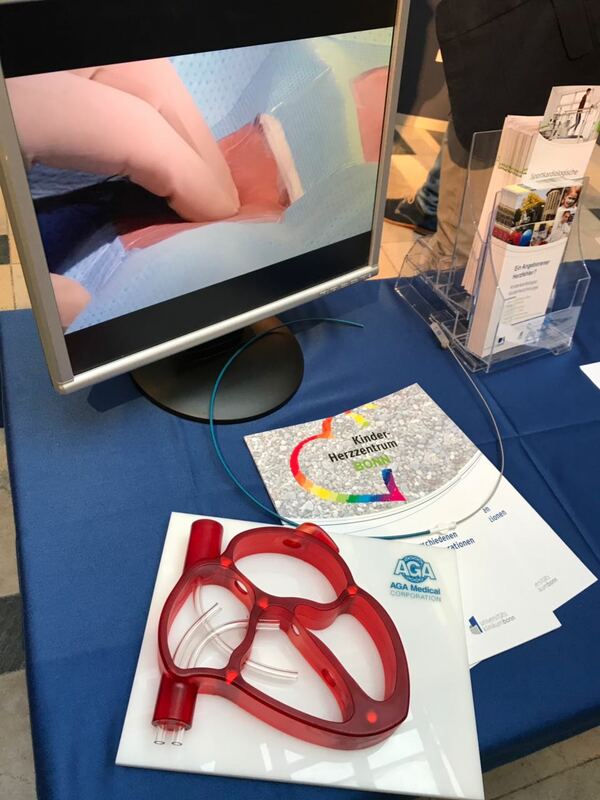 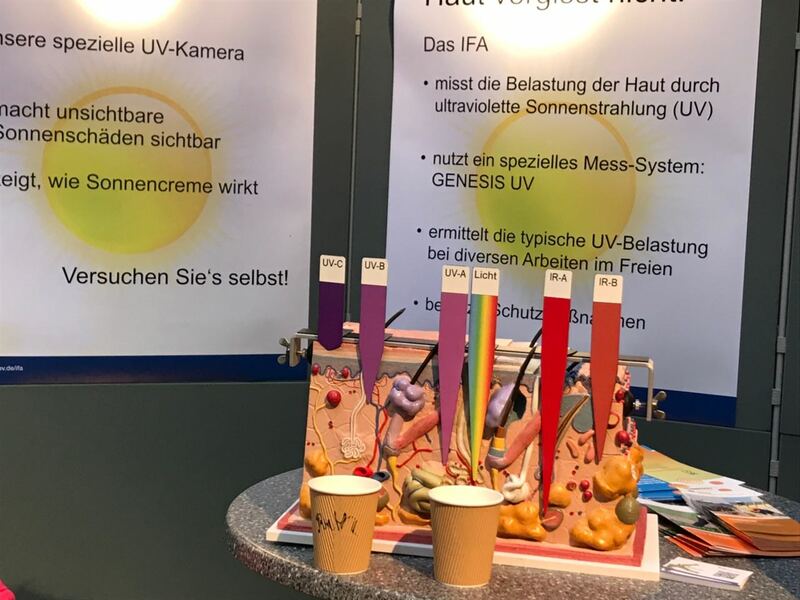 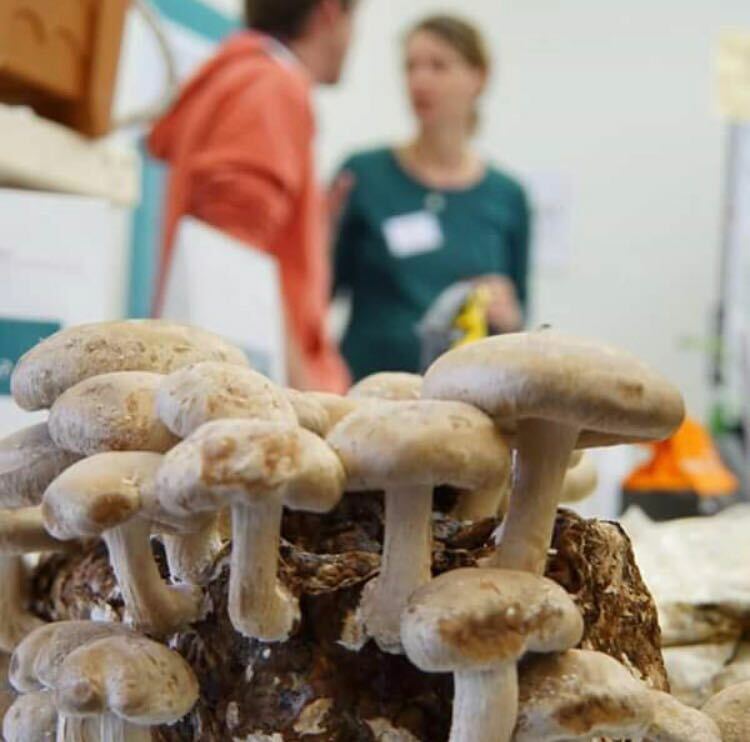 Tailored to the common topic “Cycles”, there were exhibitions, presentations and performances by universities and research institutes of the local area “Bonn-Rhein Sieg”. 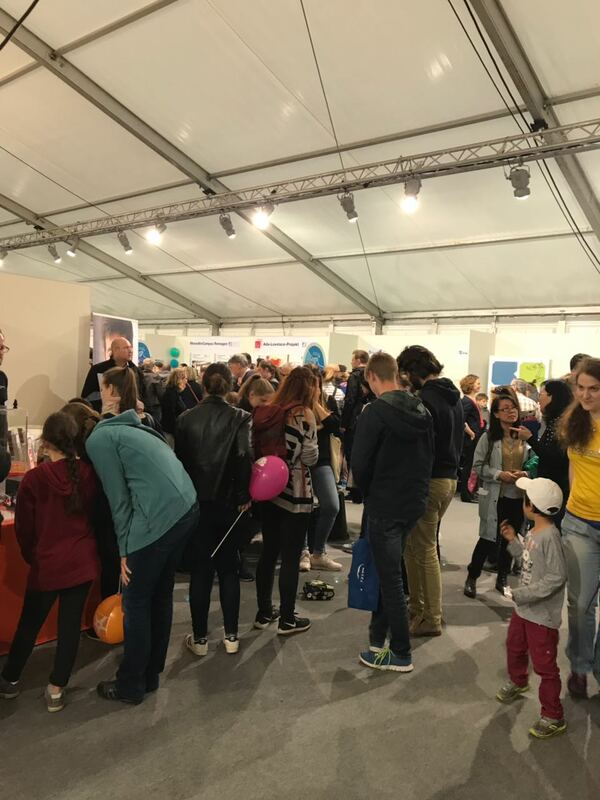 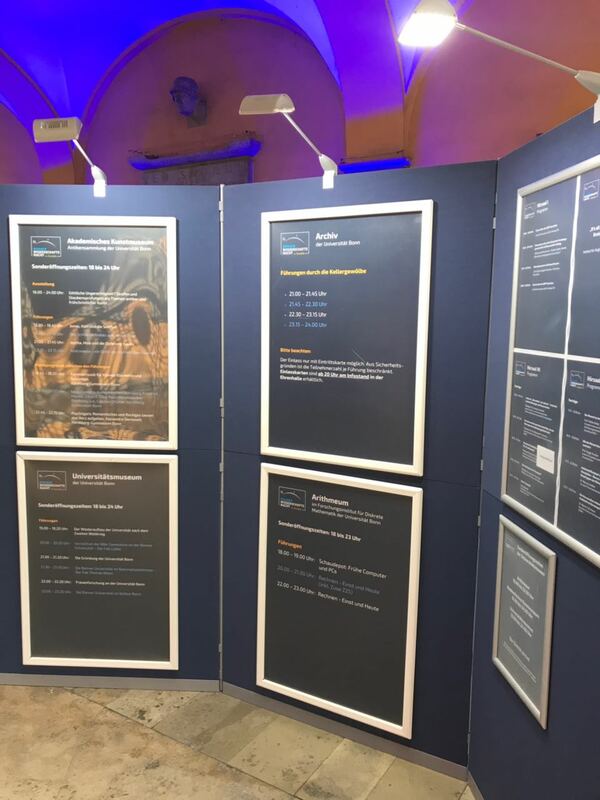 The event that takes places every other year offers an opportunity for a broad audience to dig into a variety of interesting research activities.This year, it was a bit special, why? 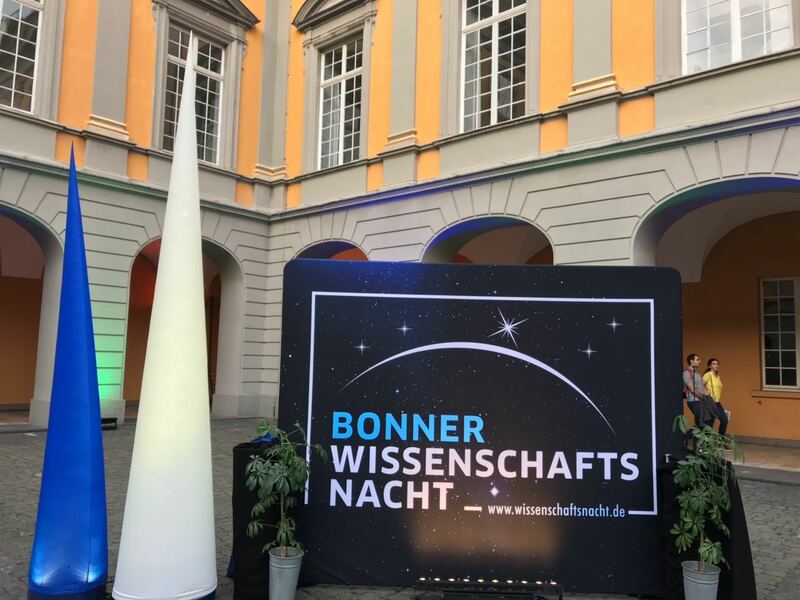 Uni Bonn is celebrating its 200 Jubilee and I was happy to be part of this event and to represent ZEF together with my colleagues. 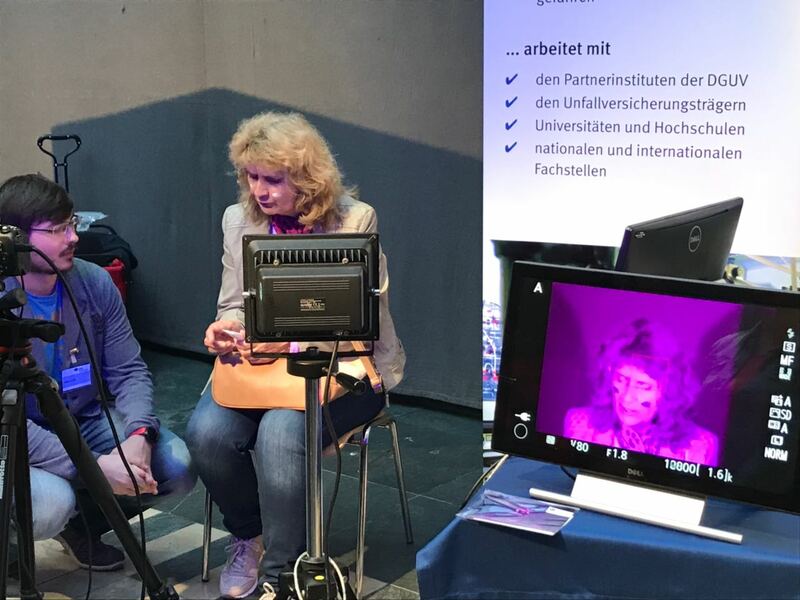 Here you can see some impressions from the Science Night various exhibitors. 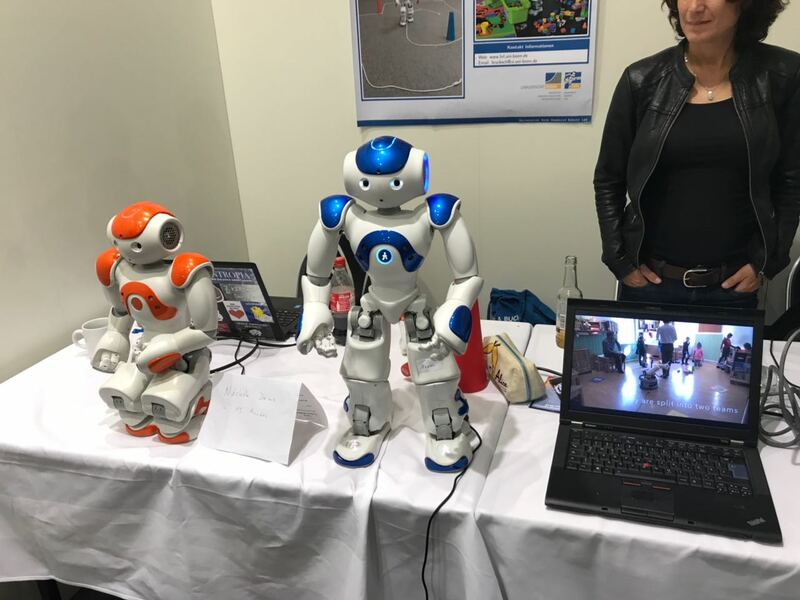 Marwa went on a hunt for Naomi the humanoid robot and she was extremely happy when she found her and saw her perform some housekeeping tasks. 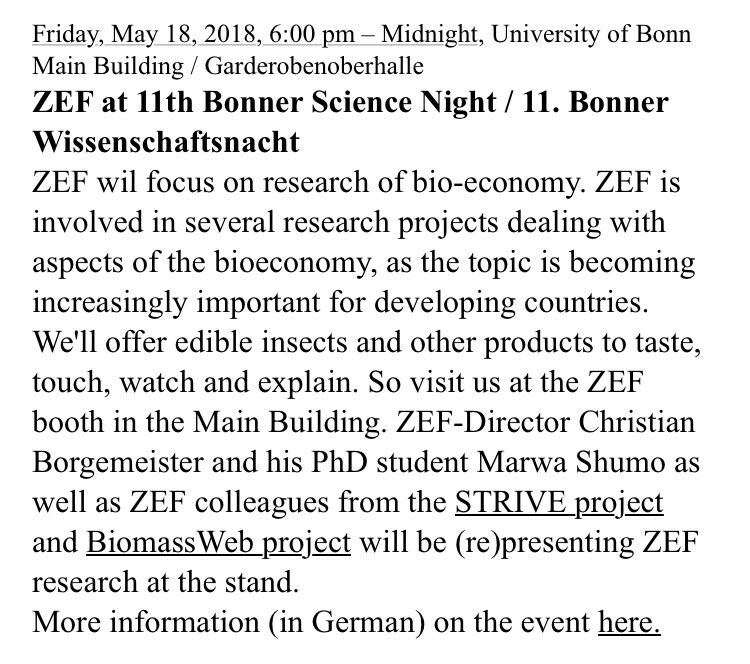 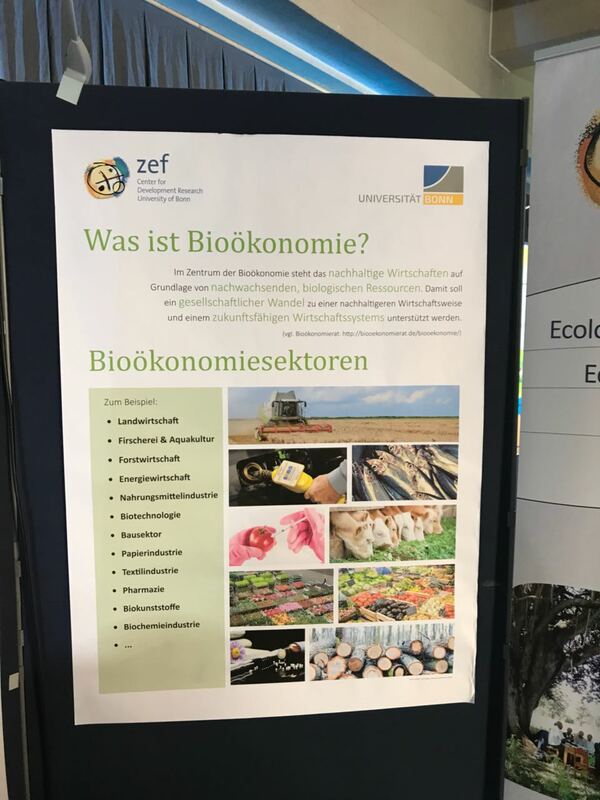 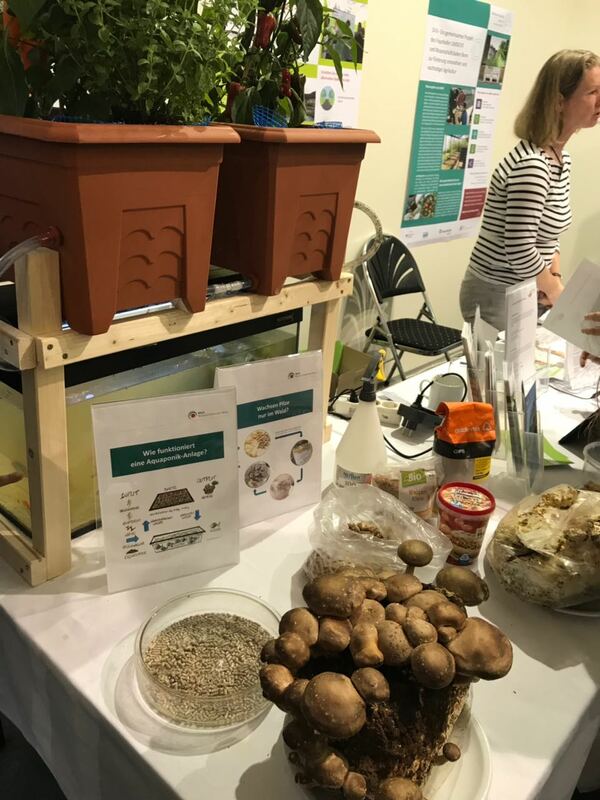 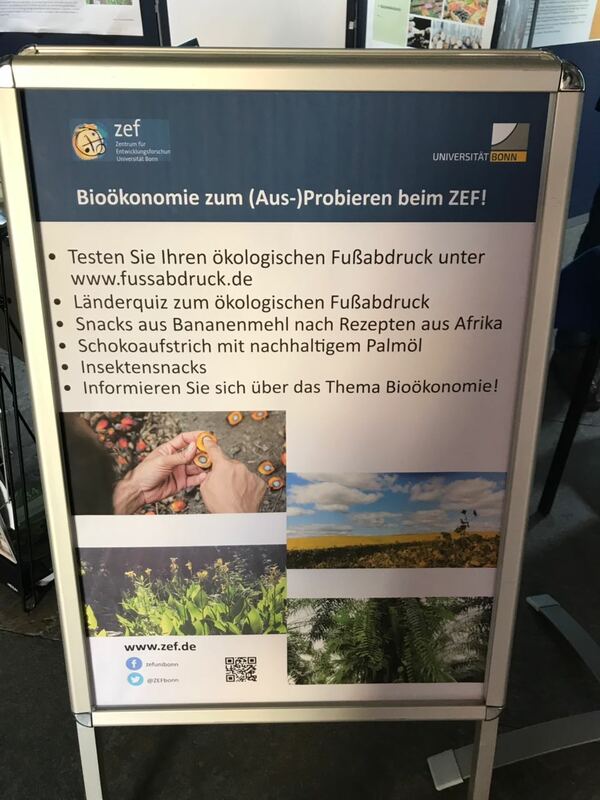 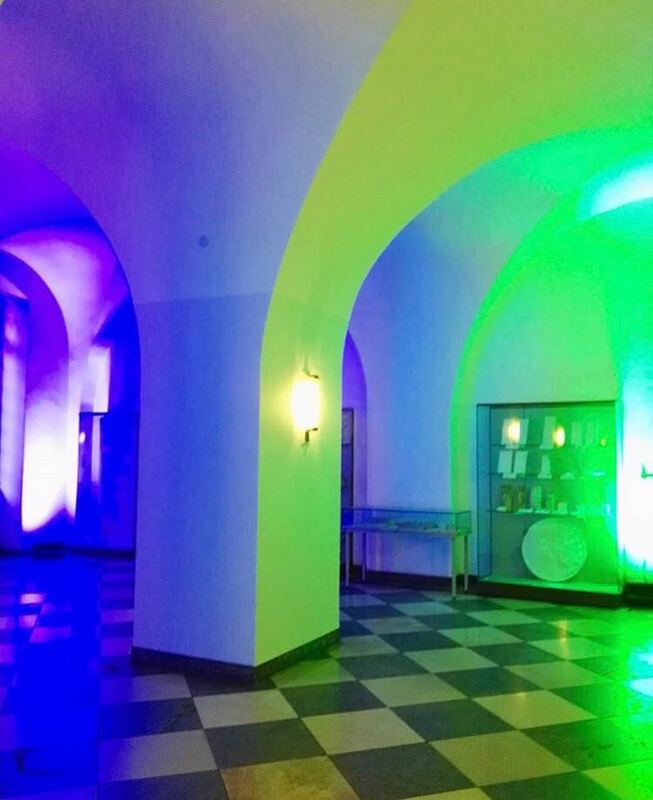 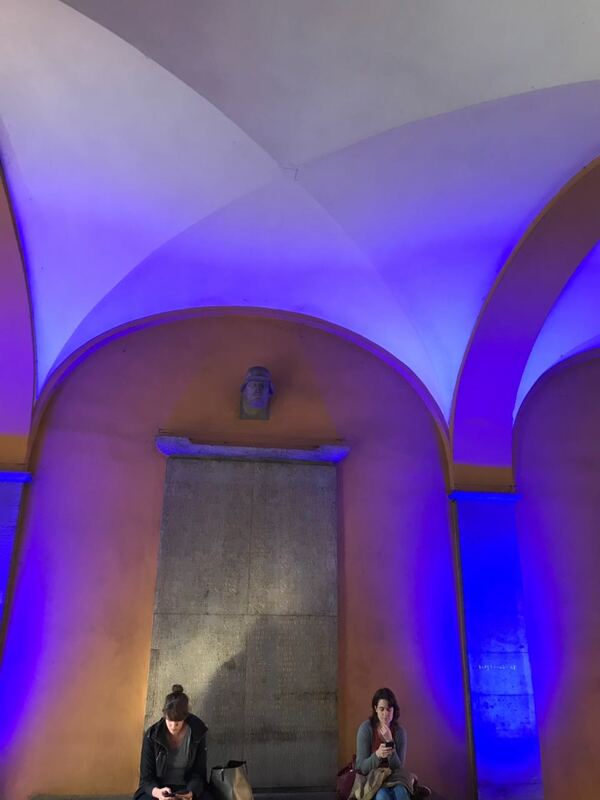 As ZEF’s research is dealing with different aspects of bioeconomy relevant for developing countries, the main theme of ZEF’s contribution to the Science night was surrounding the topic Bioeconomy. 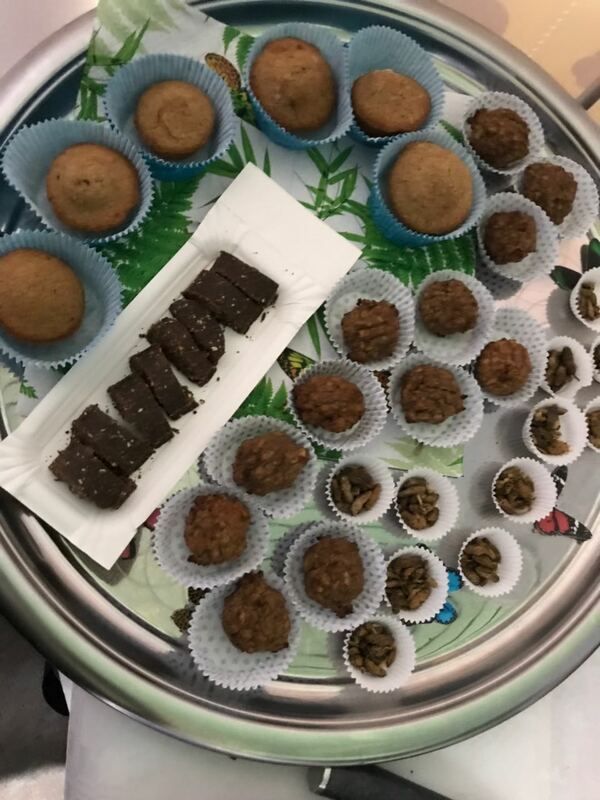 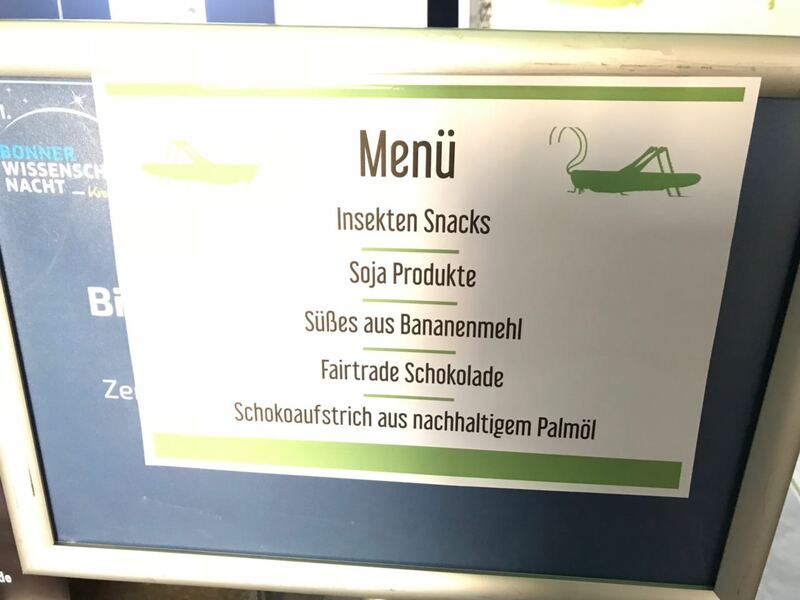 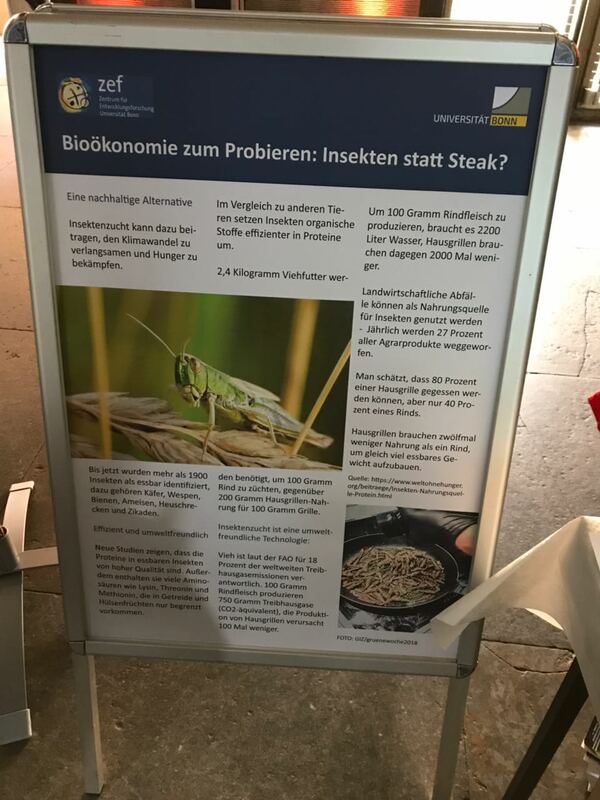 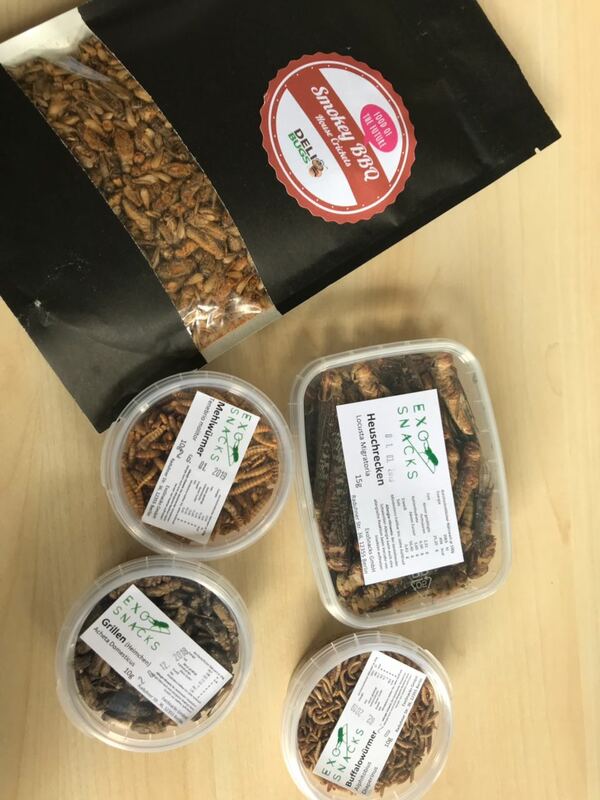 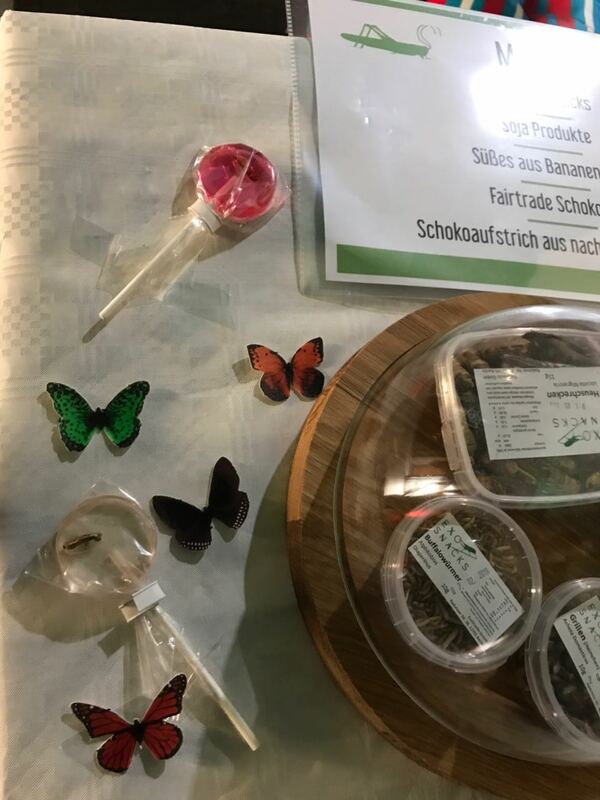 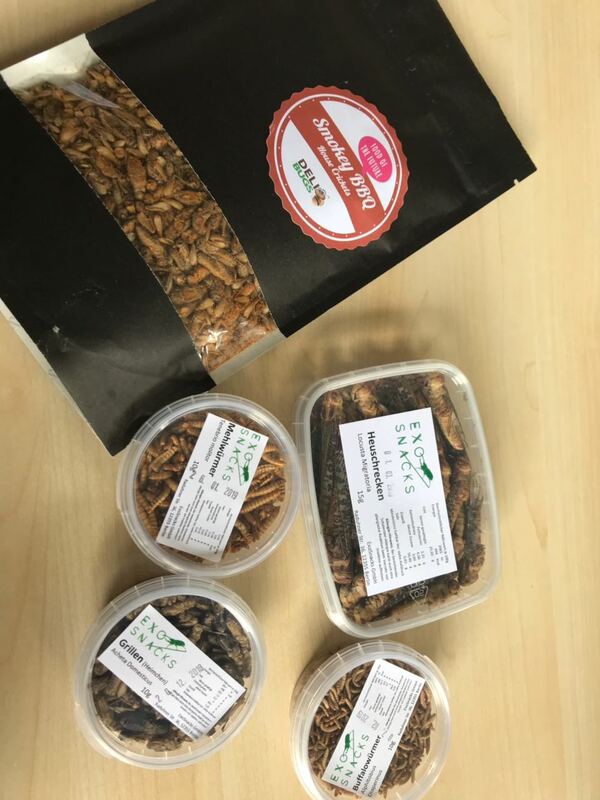 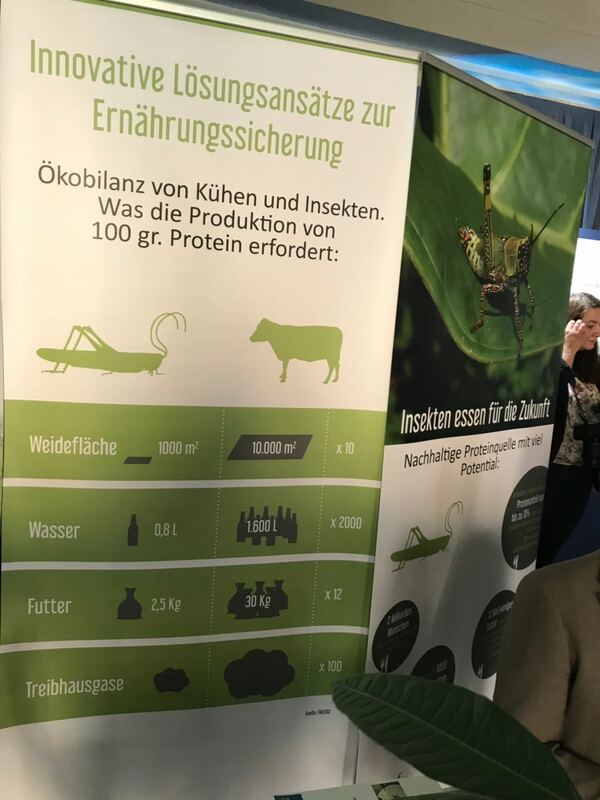 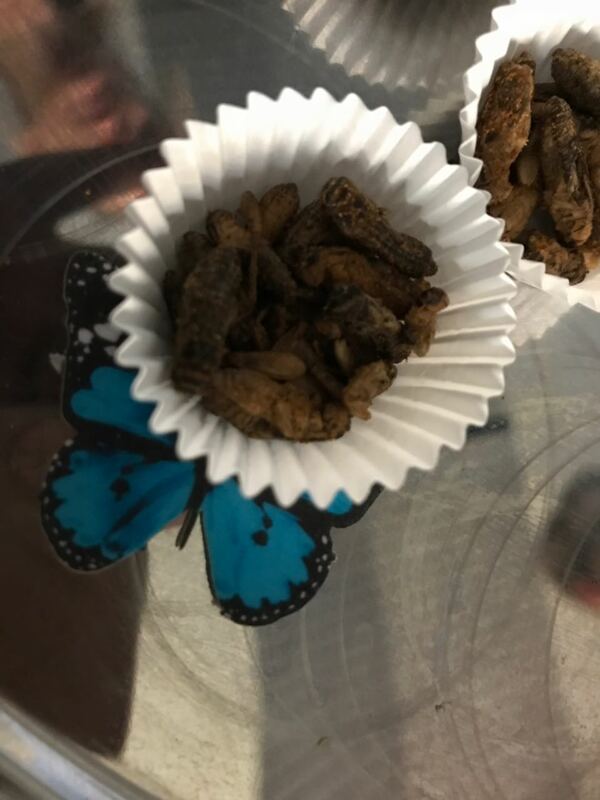 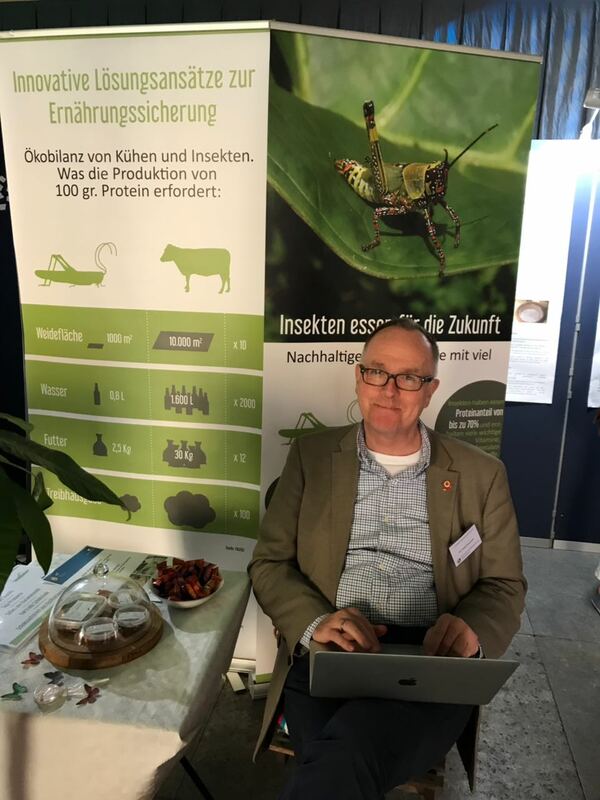 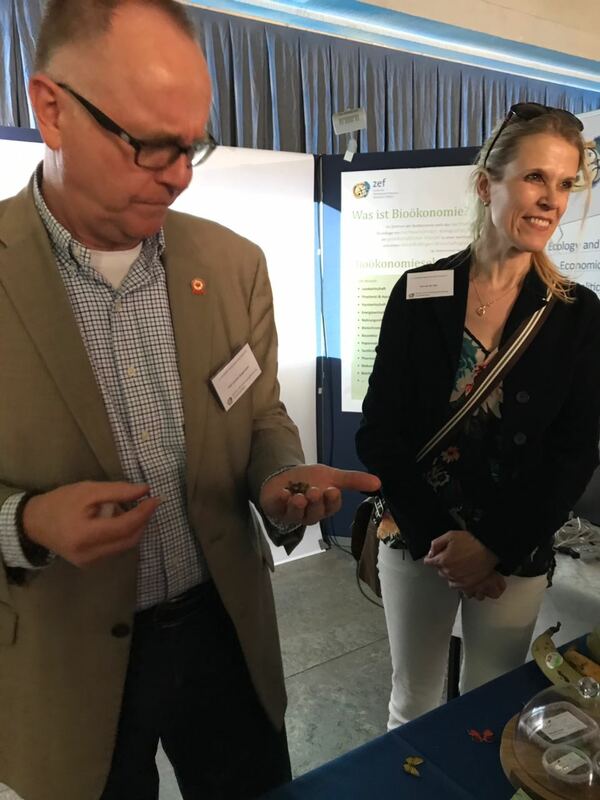 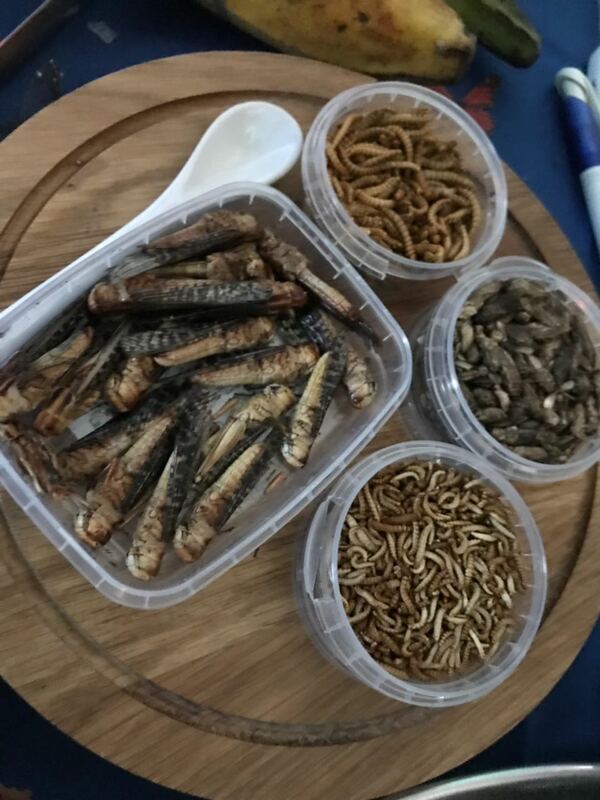 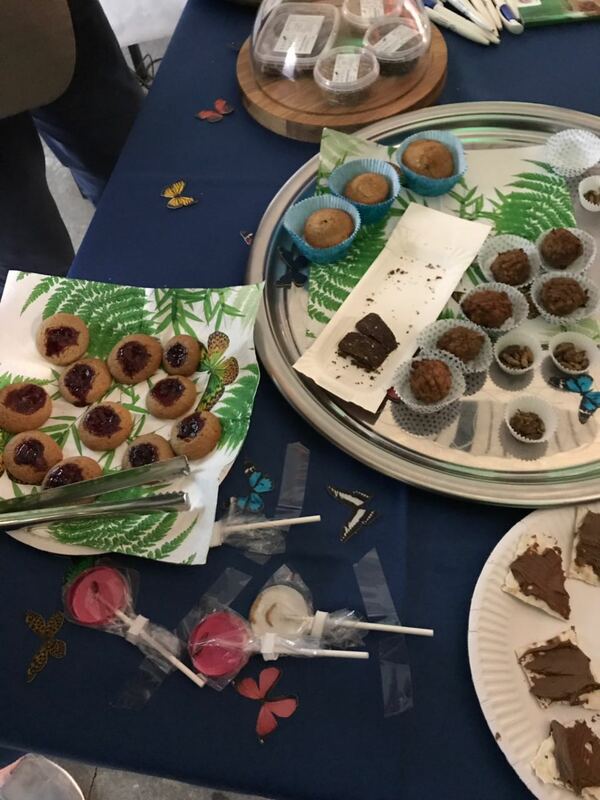 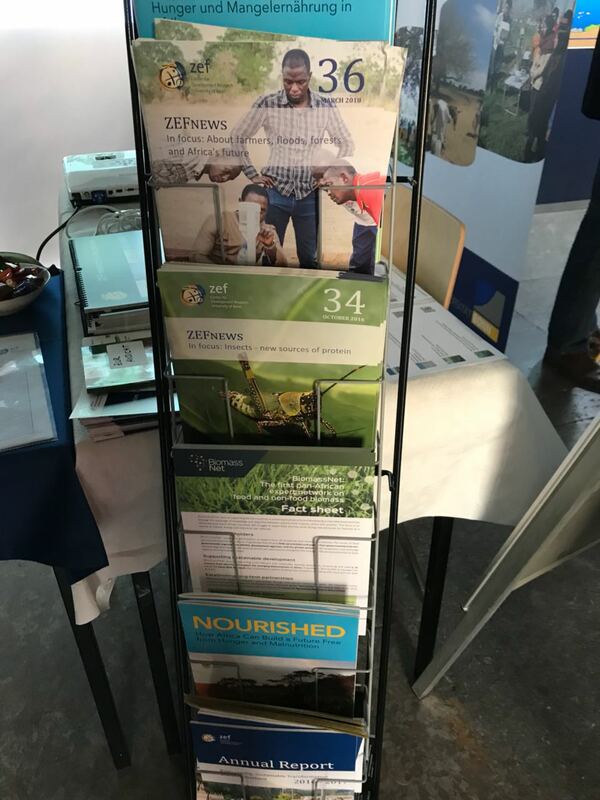 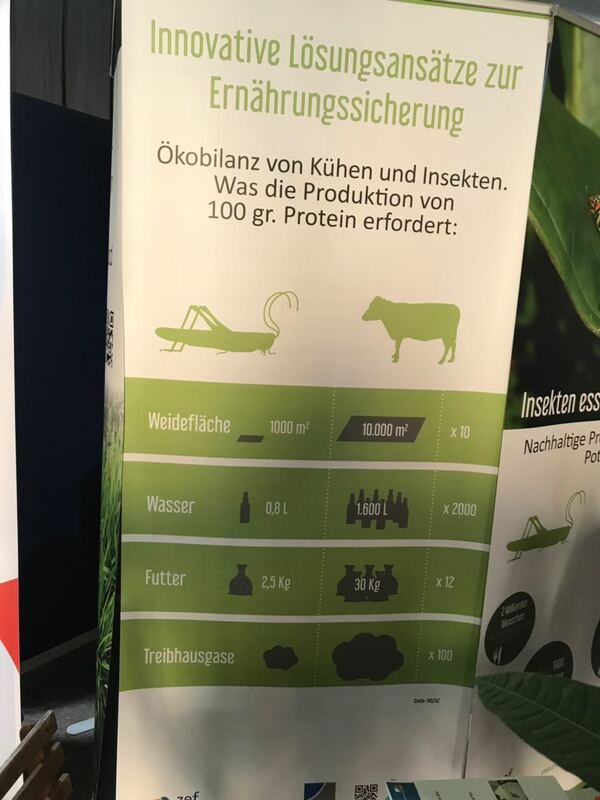 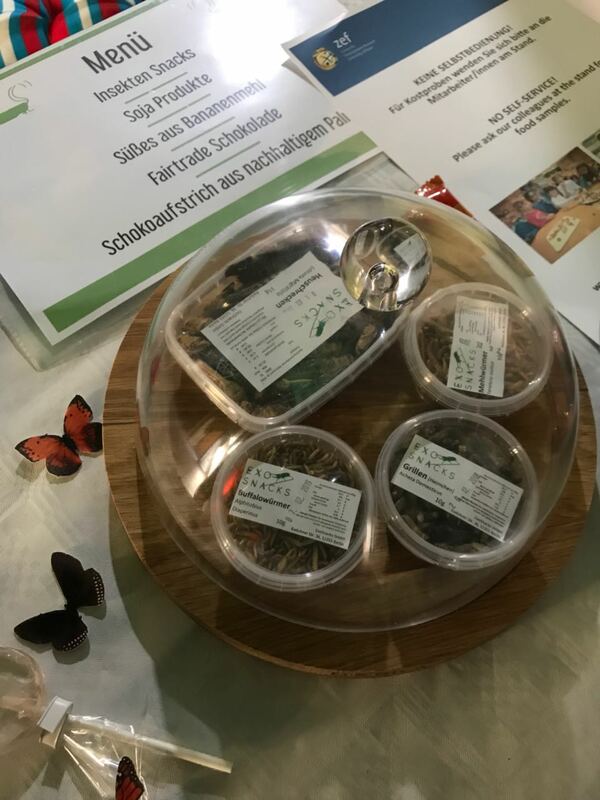 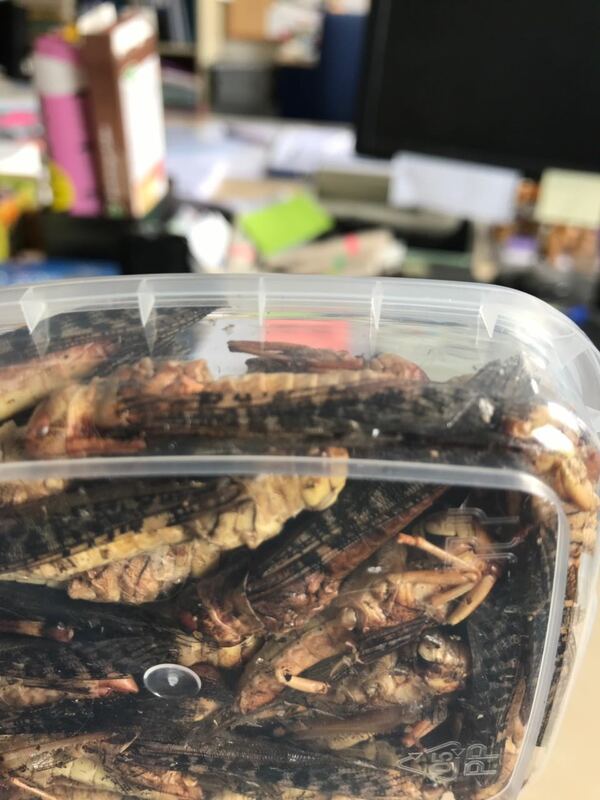 At the ZEF stand, edible insects and other bio-economy products were offered to taste, try, watch and explain. 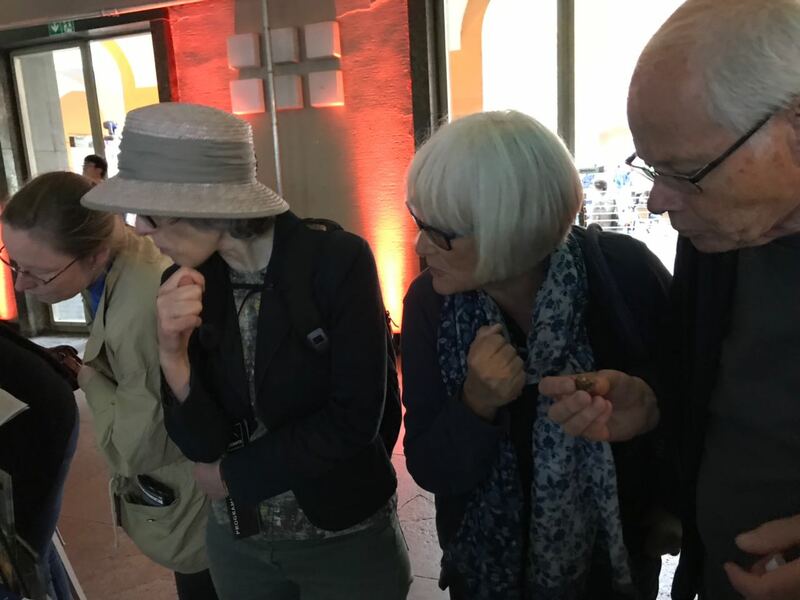 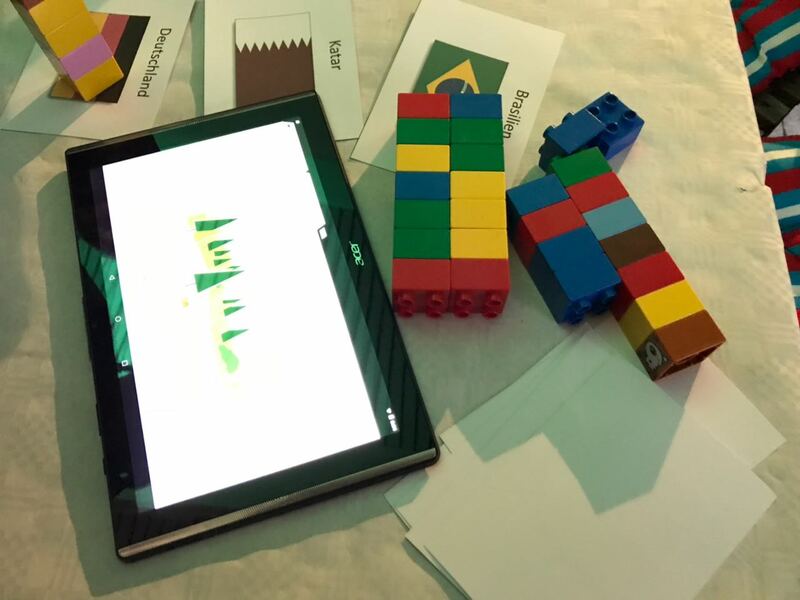 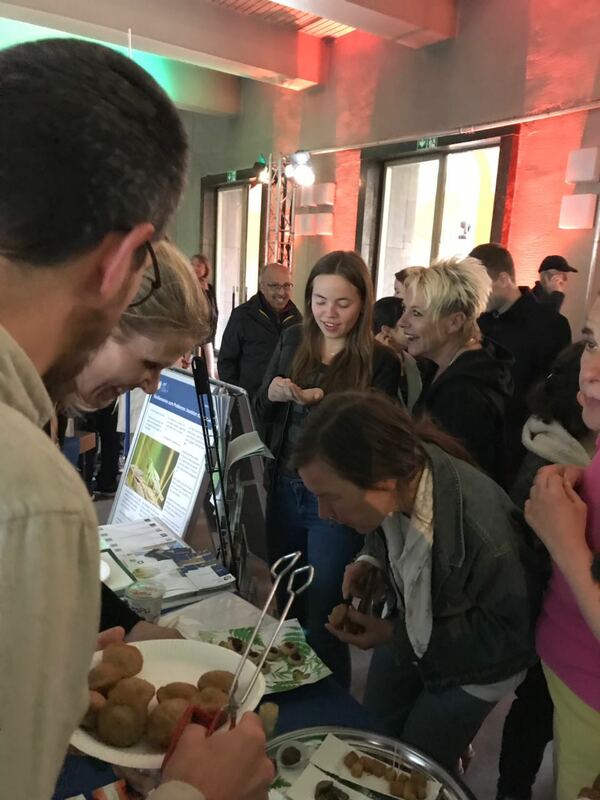 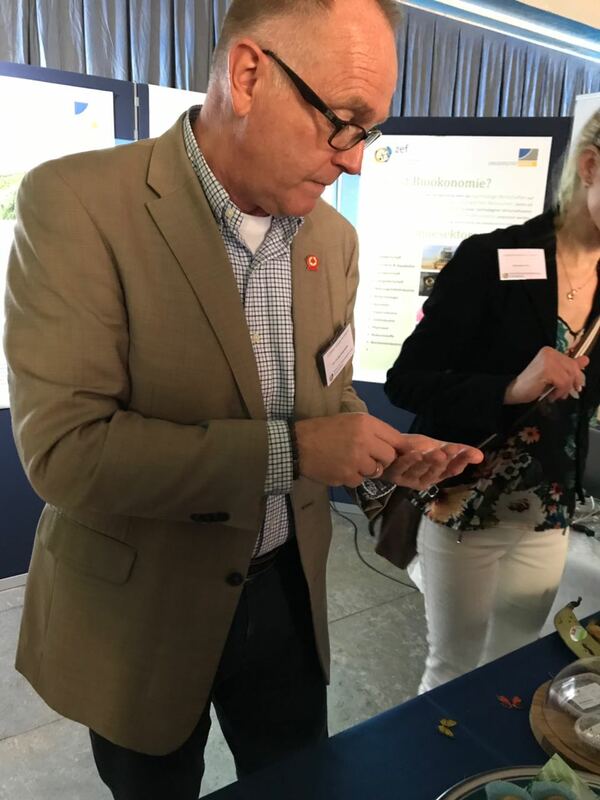 Visitors were also given the chance to test their ecological footprint in a quiz and talked to ZEF researchers from Strive and BiomassWeb projects about what bio-economy is all about. 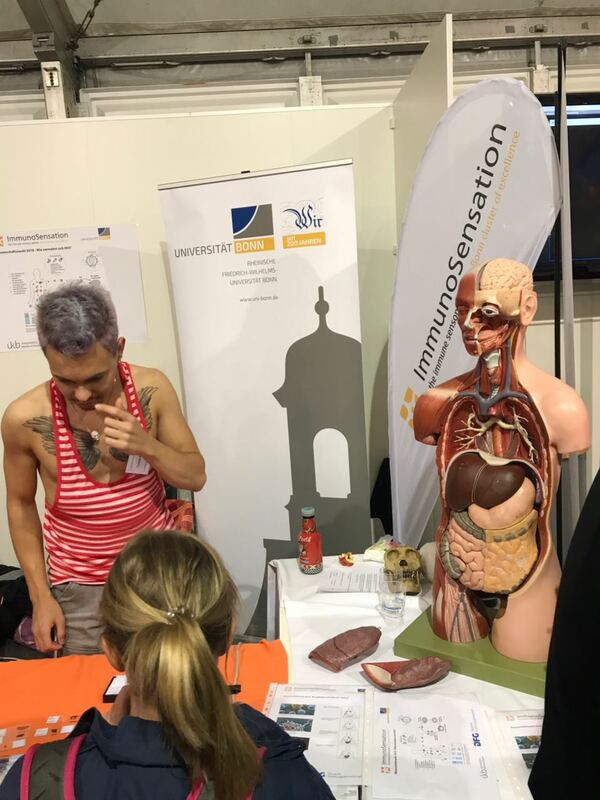 And some impressions from our stand on the Science Night itself. 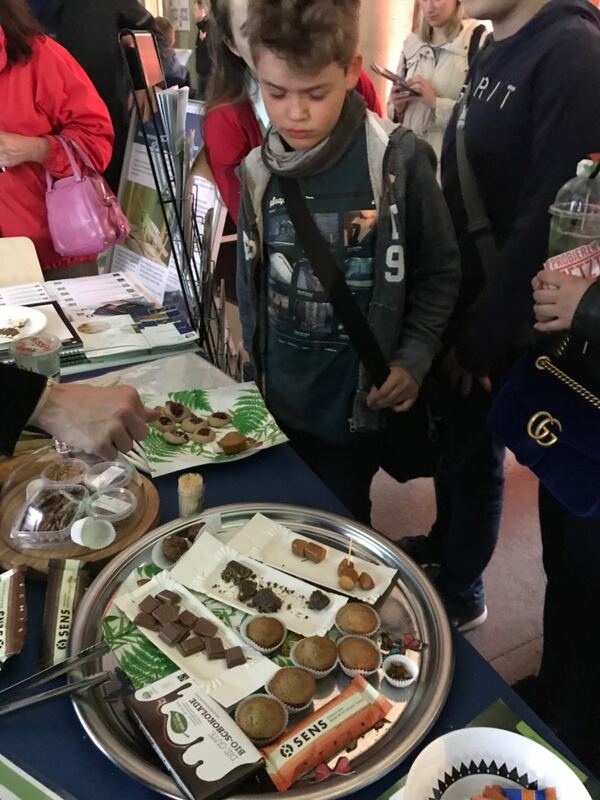 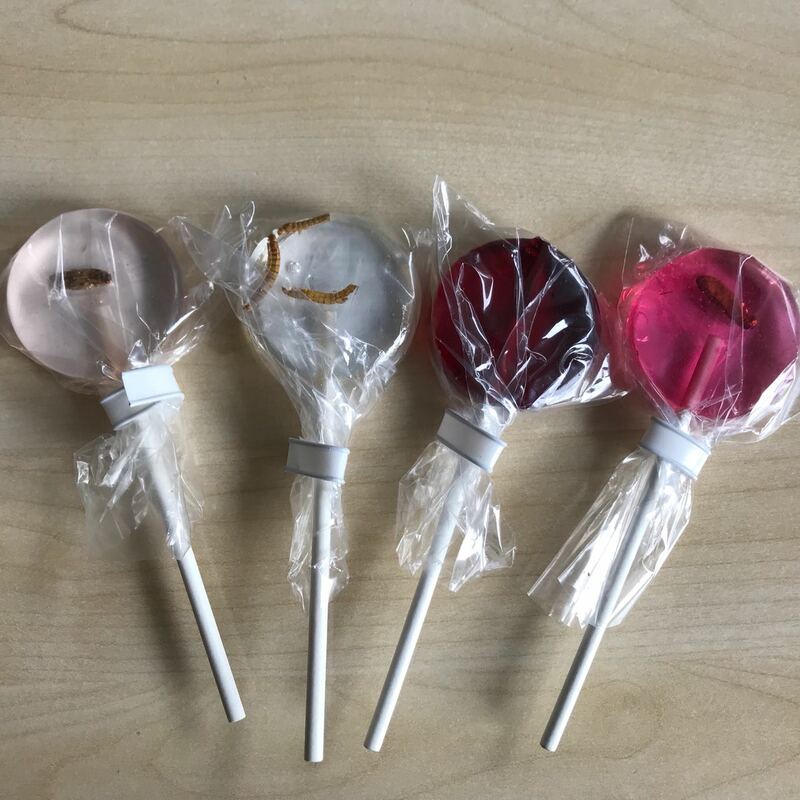 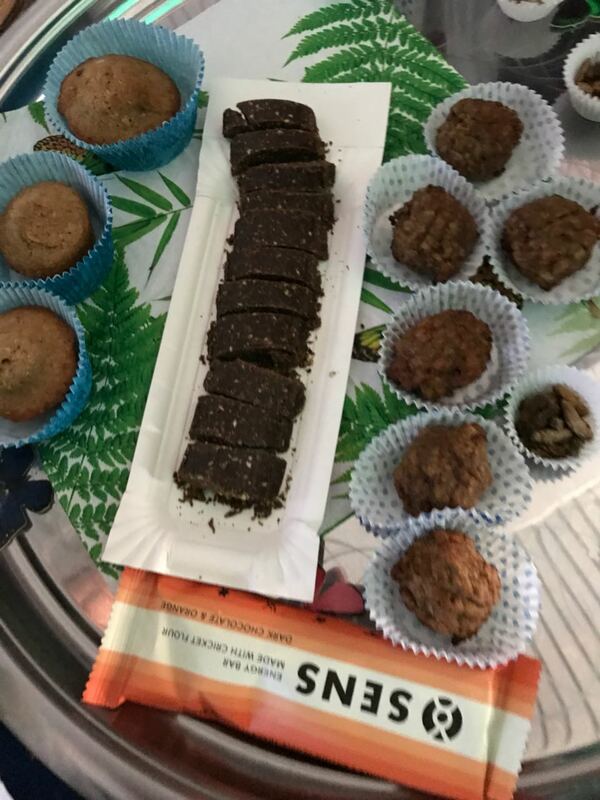 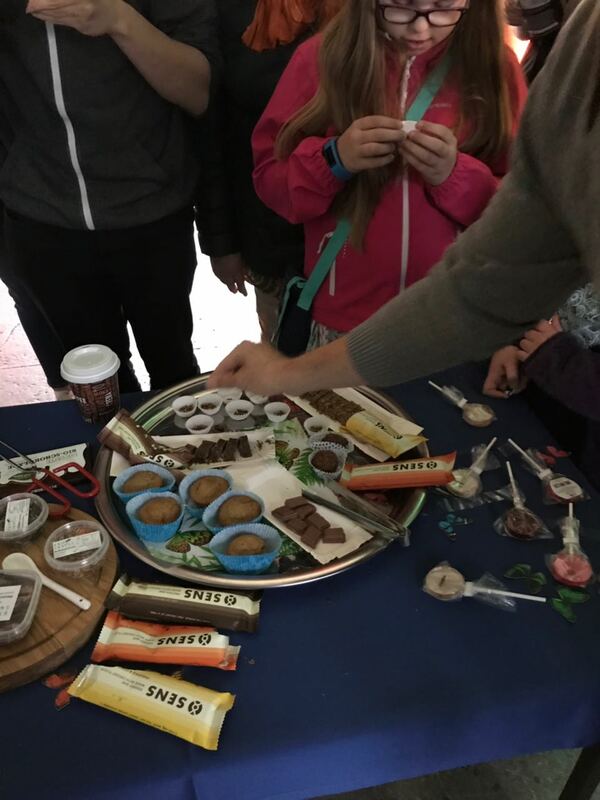 You can see that we had a lot of visitors who were interested in trying and tasting our various products and were keen to know more about the research behind. 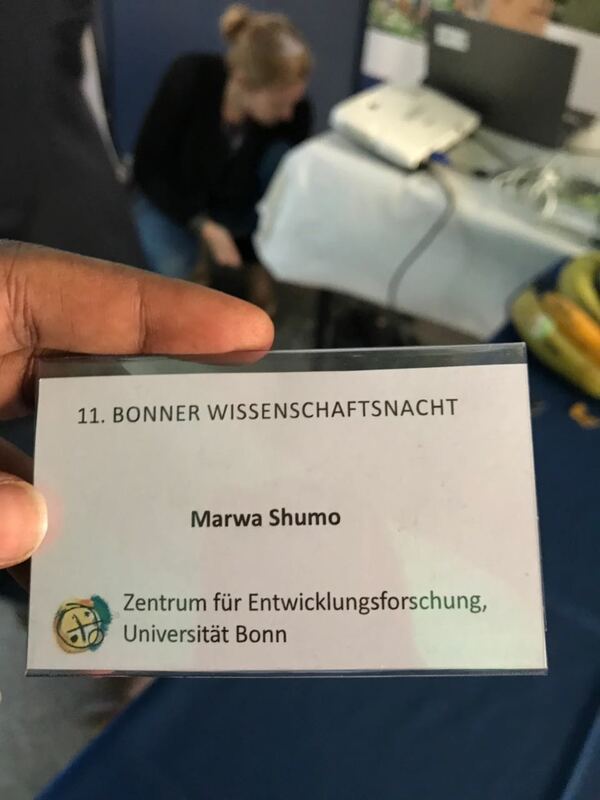 It was a successful event that brought our eventful spring into an end, and Marwa is now looking forward to our next event that shall take place this summer. 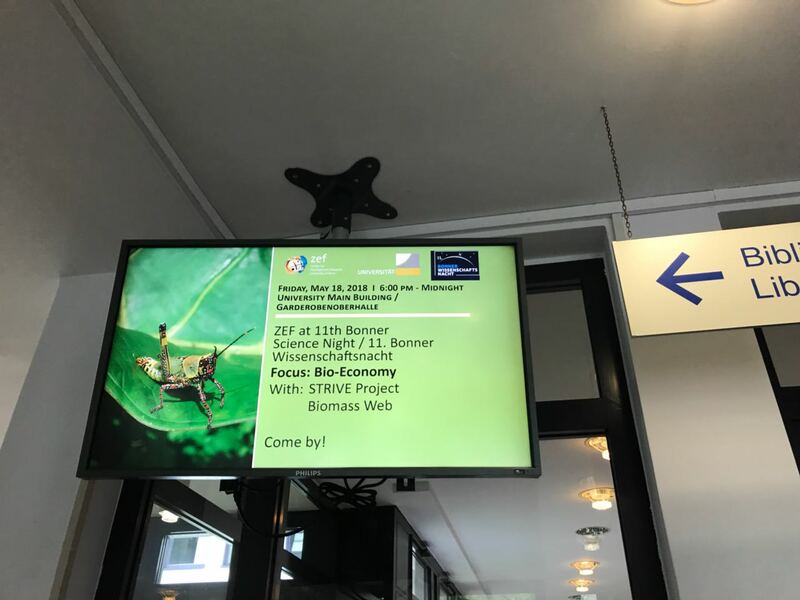 Enjoy the sunshine.